Camping or backpacking in winter is appealing for many who enjoy the serenity of wilderness settings without the crowds and bustle of the summer season. But as rewarding as they can be, these outings require special preparation and a different set of skills than are necessary at other times of the year. Snowfall can quickly cover one's tracks and make orientation difficult. Hypothermia is insidious, and rapidly changing weather conditions can become treacherous, even life-threatening.In addition to those who are exploring the outdoors recreationally, there are also those who find themselves in unexpected winter survival situations. Each year, people become stranded in wilderness areas, and in most cases they are not equipped to face the challenge of spending an indefinite amount of time outside. Without sufficient gear or knowledge of how to improvise without it, injury or death is often the result. The development of some basic skills, however, can help avert such unfortunate outcomes.As the founder of the renowned nature awareness program Primitive Pursuits, Dave Hall has been practicing survival skills for more than twenty years and has amassed a comprehensive understanding of winter survival. By refining these skills, Dave has reached a point of understanding that is without peer. 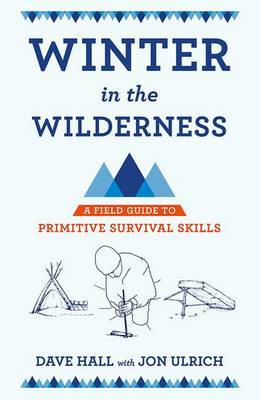 Through detailed explanations, illustrations, and personal anecdotes, Winter in the Wilderness imparts Dave's knowledge to readers, who will learn to meet their most basic needs: making fire, creating shelter, obtaining safe drinking water, navigating terrain, and procuring sustenance.Winter in the Wilderness is a handbook for those who want to explore cold-weather camping and those who might find themselves in need of this critical information during an unexpected winter's night out. Whether used for pleasure or for survival, Winter in the Wilderness emphasizes the benefits of enriching and deepening our connection with the outdoors.